YOYOW, a Graphene based DAC for User Generated Content(UGC), has just finished its ICO campaign in only 3 days and raised 2,000 bitcoins. The crowdsale started at May 21th 21:00 EST 8, scheduled to last 30 days, but it only took 70 hours to sell out all the tokens for the crowdsale. 300 million YOYOW, which takes 30% of the total supply 1 billion, have been sold out through 4 platfroms, BTS DEX, ICOAGE, ICO365 and BTC9.com. The average price of the ICO was 1BTC = 150k YOYOW. "We'd like to thank our partners, community and everyone involved." Said Newtree(Baicai), the founder of yoyow.org "And next, we will work hard and make sure the mainnet will be launch before October . " It's worth mentioning that a total amount of 50 million YOYOW were sold through the bitCNY:YOYOW market of BTS DEX, at three different times, and it only takes less than 20 seconds to finish each time. It proves the superiority of Bitshares as an ICO platform, also, more than 5 million BitCNY is deposited in BTS DEX, so it helps the growth of smartcoin volume. If you check the history of bitcny supply in the past week, you may find that the supply doubled. 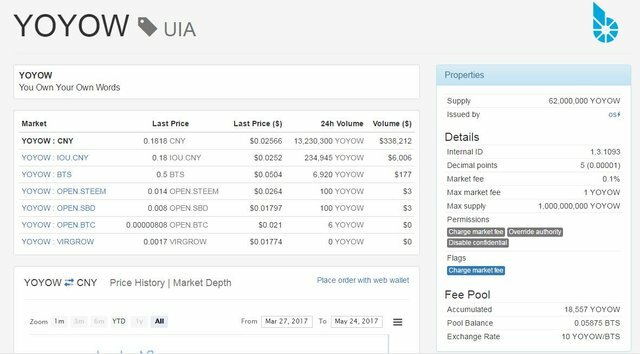 Now YOYOW can be traded on bitCNY:YOYOW or IOU.CNY:YOYOW market in BTS DEX. More centralized exchanges also show interests to list YOYOW once the testnet is launched. To note that only the 50 million YOYOW that were sold in BTS DEX are now liquid for trading, whereas all others, including the tokens got from third party ICO platform, and the part belong to founder team, are not liquid until the official blockchain is launched, hopefully in four to six months. Congratulation for your crowdfunding @jademont. Best luck to all the team and make sure you keep an eye on what is going on at EOS - The Newly announced Blockchain Operating System. You will probably leverage the infrastructure since it's being using the design pattern of Steem & Bitshares. Hmm, 3 days and from what I hear within seconds on the bitshares dex, not too sure how this could be construed as a better token distribution than steem. So much for trying to solve the whalepower issue then. Didn't even know about this ICO. Would have invested if I would have known. Insane fast lately we see ICO struggling to achive hard cao and here in three days. I just bought some at bitfinex. Which u and your project all the best!